Ivan Toney in action for Posh against Southend. Photo: Joe Dent/theposh.com. Peterborough United manager Darren Ferguson is backing top scorer Ivan Toney to rediscover his scoring form in the final seven matches of the League One campaign. 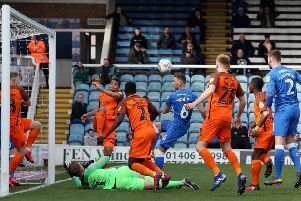 Toney played well as Posh beat Southend 2-0 at the ABAX Stadium yesterday (March 23), but the win would have been far more comfortable if the 23 year-old had accepted a couple of decent scoring chances in the first-half. Toney also saw a ’goal’ disallowed for offside early in the second-half. Ivan Toney's 'goal' for Posh against Southend was ruled out for offside. 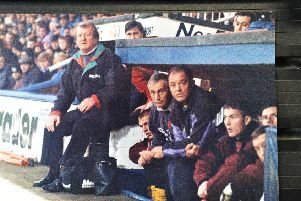 “Ivan played really well,” Ferguson stated. “Apart from the most important part of his job really. “He held the ball up, he won most of his battles, he worked his socks off and at times he linked up really well with Lee Tomlin. “It’s a shame he didn’t score, but you can see he looks a wee bit nervy in front of goal. “He has no reason to be. Nineteen goals is a great effort and if he keeps getting into scoring positions I have no doubt the goals will start coming again. Fellow striker Matt Godden’s form in front of goal is also a concern. He has scored 16 goals in his first Posh season, but he has scoerd just twice - in the same game against Wycombe last month - since December 15.